Prior to starting Logical, Toshy Penny worked at Savvy Rest, developing strategic projects to meet internet marketing goals. As Marketing Project Manager, Toshy increased profit with search engine optimization and paid search. He created content that continues to rank, drive leads and create sales. Goal: Rank for the competitive phrase "chemical free mattress" and explain Savvy Rest's position on the phrase. Toshy researched keywords and articles to uncover the query's intent and deliver relevant content to rank. Result: Savvy Rest went from unranked to #1. 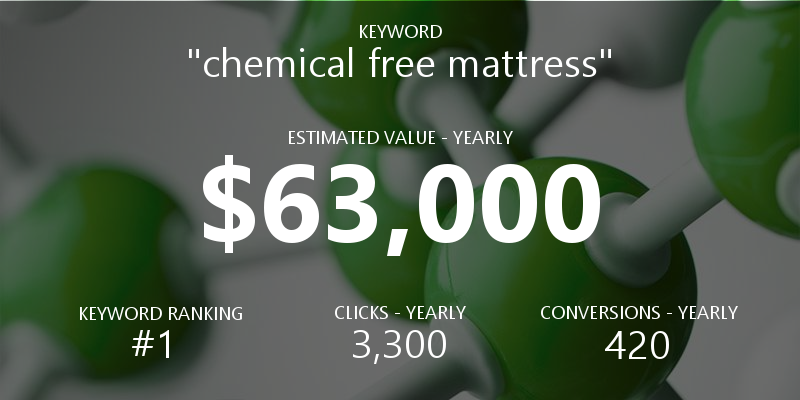 “Finding a Chemical-Free Mattress” continues to drives high-value conversions. Goal: Capture organic traffic from "mattress topper" searchers with "back pain", "hip pain", or "shoulder pain". Toshy researched content and keywords to create the foundation (structure, title, and key elements (H2s) of the article). Result: Savvy Rest ranks 1st and 2nd for the targeted keywords. “Choosing a Mattress Topper” is the company's 3rd best landing page and continues to drive valuable conversions. Role: Optimize account structure, find new keywords, adjust bidding, write ad copy, and create landing pages. Goal: Use data in Google Analytics to boost traffic, rankings, and conversions for Savvy Rest. Role: Flag webpages for potential to increase conversions. Develop content and modify meta tags to reach goals. Result: Savvy Rest's new and updated content led to a 33% increase in organic traffic that continually drives new leads.